« Happy, Healthy New Year! Quarry Hill resident Eva Smith never set out to be a “poster child” for active senior living. But when the Midcoast’s outstanding Pen Bay YMCA went looking for the perfect spokesperson for the its annual fundraising campaign, Eva was the obvious choice. 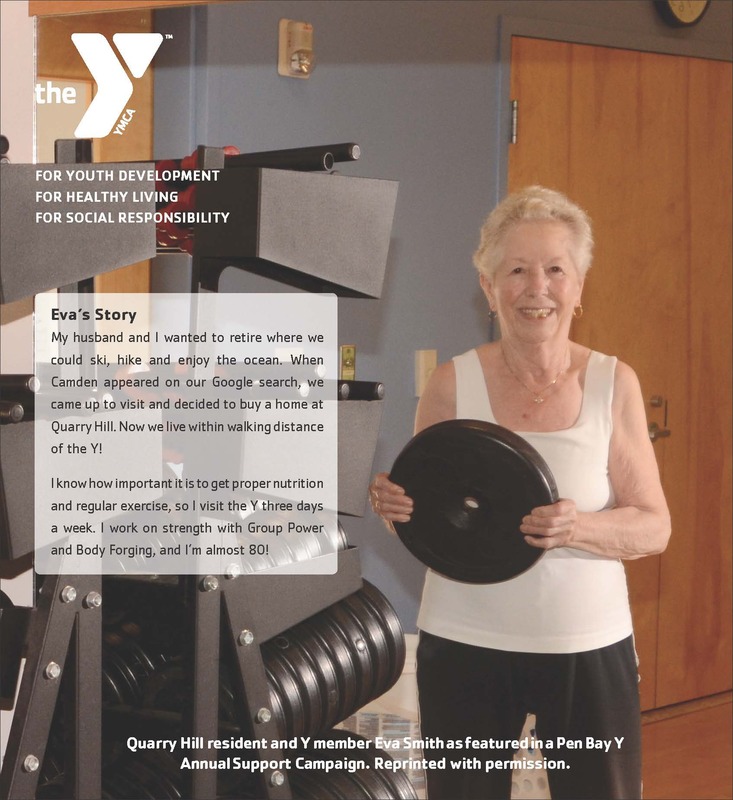 Of course, the Y is just part of the healthy, active lifestyle that Eva—and so many like-minded folks in her age group—have found in Midcoast Maine. From the ocean to the lakes to the surrounding mountains, Camden’s stunning natural setting has seniors here sailing, swimming, biking, hiking, and power-walking their way to fitness and loving every minute. The Mid-Coast Recreation Center adds skating and tennis to the area’s mix of indoor options, while outdoor recreation areas (two golf courses, Camden Hills State Park, and a downhill and cross-country ski center to name but a few) inspire four-season forays into the rugged beauty and fresh salt air for which the coast of Maine is renowned. For Quarry Hill residents, there’s even more to keep folks moving. Our 26-acre campus, laced with paved walking paths, are a walker’s paradise. Our Fitness Room offers unlimited use of a treadmill, rowing machine, and stationary bikes; and free onsite fitness classes, led by YMCA instructors, promote strength, flexibility, and healthy camaraderie. Heck, in a pinch (or the occasional snowstorm), a person can get a pretty good workout, just walking the halls of the Anderson Inn! We encourage everyone to follow in Eva’s sneaker-steps and stay well by staying active. For more information about health and wellness programs at Quarry Hill, visit our home page, click on “Lifestyle” and then on “Health and Wellness.” Or, pick up the phone (flex those biceps!) and dial 207-921-6116. We love to talk fitness! This entry was posted on Friday, January 24th, 2014 at 1:02 pm	and is filed under Blog. You can follow any responses to this entry through the RSS 2.0 feed. Both comments and pings are currently closed.